Discover a land of nature beyond measure! From Tadoussac to Blanc-Sablon and Baie-Comeau to Schefferville, Côte-Nord is a land of nature beyond measure. Recognized as one of the best places to see the whales of the St. Lawrence, Côte-Nord is also an extraordinary playground for outdoor lovers and nature enthusiasts. Hiking, sea kayaking, wildlife observation, hunting and fishing are only some of the activities you can enjoy during a stay or road trip in this region. While Route 138 crosses several rushing rivers on its way from Tadoussac to Kegaska, Route 389 will take you to northern Québec. From Kegaska, which is about 40 kilometres (25 miles) east of Natashquan, you can embark on a cruise aboard a cargo-passenger ship, the Bella-Desgagnés, to discover the fascinating Lower North Shore. Côte-Nord is home to the Whale Route, which runs along the coast. The 13 species of whales found in the St. Lawrence can be observed from the shore or during sea excursions, from the small harbour porpoise to the enormous blue whale, the largest mammal on the planet. This region is one of the five best whale-watching destinations in the world, in terms of both the number of observable species and the quality of the whale-watching experience. 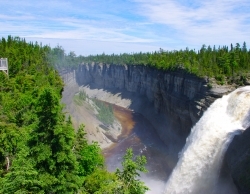 Côte-Nord boasts four national parks. While you can encounter marine mammals at the Saguenay–St. 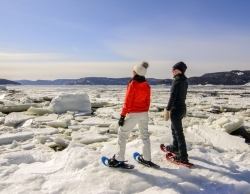 Lawrence Marine Park during interpretive activities and sea excursions, a visit to the Fjord-du-Saguenay National Park will introduce you to the majestic scenery and intriguing marine wildlife of the Saguenay Fjord, which was carved by glaciers several million years ago. Further east and nearly at the end of Route 138, discover the mysteriously shaped monoliths in the Mingan Archipelago National Park Reserve. Among the many seabirds in the park, keep an eye out for the famous Atlantic puffins, nicknamed sea parrots because of their brightly coloured beaks. On Anticosti Island, Anticosti National Park presents nature at its best and most unusual: canyons, cliffs, fossils, crystal-clear waters and more. Covering an area of about 7900 km² (3100 sq. mi. )—or about twice the size of Rhode Island and 16 times that of the Island of Montréal—Anticosti is home to only 300 people and 166,000 white-tailed deer! 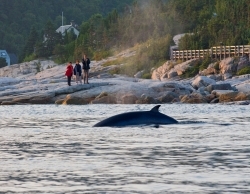 While Tadoussac, a member of the Most Beautiful Bays in the World Club, is the best known area for observing the whales in this region, many other locations offer exceptional whale-watching experiences. Keep your eyes peeled from April to November, and remember that several species of seals and seabirds will probably join in the show, to your great delight! In addition to marine mammals, several other wildlife species can be observed in Côte-Nord, including black bears, which you can watch in complete safety with a professional guide. 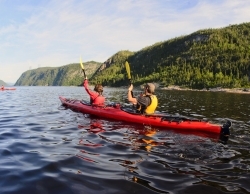 Sea kayakers can paddle along the coast or in the Saguenay Fjord, while scuba diving enthusiasts can explore the rich seabed. In Baie-Comeau, the Jardins des Glaciers (Glacier Garden) will take you back 20,000 years. Enjoy a spectacular multimedia show as you learn about the impact of the last ice age and climate change. A visit to the Sept Îles Archipelago will give you the opportunity to go hiking and wilderness camping. Culture and history buffs are also in for a treat. The coastline and islands of Côte-Nord are dotted with 17 lighthouses, 5 of which offer interpretive activities or lodging. In Natashquan, where famous Québec poet and singer/songwriter Gilles Vigneault grew up, you can visit a museum that pays tribute to him as well as Les Galets, a heritage site that presents the history of cod fishing in this area. Before heading northward on Route 389, be sure to visit Baie-Comeau, a vibrant city located in the middle of the Manicouagan-Uapishka World Biosphere Reserve. While the coast offers magnificent fine-sand beaches, the interior’s many lakes and rivers make it attractive to anglers and hunters alike. Giant dams have been built on some of these waterways, including the largest multiple-arch-and-buttress dam in the world, the Daniel Johnson Dam (Manic-5), a proud reminder of our industrial heritage. About 100 kilometres (60 miles) further north, the Groulx Mountains offer experienced hikers the opportunity to enjoy memorable adventures in nature, surrounded by spruce forest and taiga. Route 389 will also take you to Fermont and then Labrador—this is a unique road trip that few have had the opportunity to enjoy. In Fermont, you will be impressed by the town’s 1.3-kilometre (1-mile) windscreen complex, the only one of its kind in North America, which was designed to shield residents from subarctic winds. The five-storey structure constitutes the town centre: it contains apartments and all the community facilities, from the school and sports centre to the police station and swimming pool. Route 138 follows the St. Lawrence through a string of Acadian and Innu villages all the way to Kegaska. From there, only the Relais Nordik Inc. cargo ship or a plane can take you to Harrington Harbour, Tête-à-la-Baleine or Blanc-Sablon. Jacques Cartier called this region the “land of many isles” for good reason! Today, the Lower North Shore is made up of over a dozen francophone, anglophone and Innu villages. The joyous Kuei Kuei with which the Innu will greet you marks the beginning of a unique cultural adventure you must experience to truly understand. 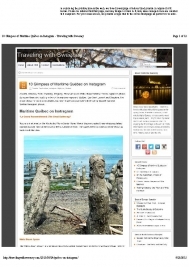 To help you plan your trip in Minganie or the Lower North Shore, contact Voyages CoSte. 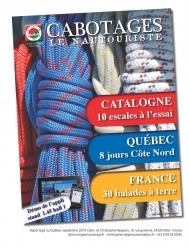 There is so much to see and do in the Saguenay–St. Lawrence Marine Park, Fjord-du-Saguenay and Anticosti national parks and the Mingan Archipelago National Park Reserve: camping, whale and seabird watching, wildlife observation, canyons and caves, sea excursions around islands and mysterious monoliths. This region is a great place to see wildlife in its natural habitat as well as enjoy hiking, sea kayaking, scuba diving, sea excursions and more. To learn more about this region, visit its many museums, interpretation centres, lighthouses and dams. Along the way, discover Côte-Nord’s fishing history as well as Innu art and culture. Shellfish is a regional specialty: try scallops, softshell clams, whelk or razor clams. 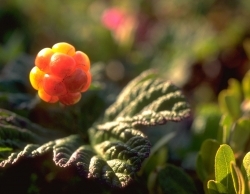 Be sure to also taste the wild berries, including the famous cloudberry. Among the 13 species found here, see if you can spot humpbacks, minkes, blue whales, belugas and more! Many activities await you in this region in the winter: resort stays, snowshoeing, skiing, dogsledding, etc. Snowmobilers will also want to ride across the longest snowmobile bridge in North America!